You wouldn’t think that one-way streets would be a spanner in the works of shopping for locally-produced food, but in my case overcoming a one-way street made a huge difference. Here was the problem: after spending Saturday mornings at the Charlottetown Farmer’s Market, Oliver and I would often drive over to Riverview Country Market to pick up some things we weren’t able to get earlier. Riverview doesn’t carry Purity Dairy milk, and so we’d hold off on buying milk with hopes that we might pick it up elsewhere. Sometimes we set out to make that elsewhere the Purity Dairy plant on Kent Street, which is open Saturday mornings. The problem we perpetually ran into is that Kent Street is one way, and so I’d head down Fitzroy Street with plans to loop around and back down Kent, but I’d forever be undershooting or overshooting and, in the end, the process proved too dizzying to build into our Saturday morning routine. A few weeks ago, though, I made an adjustment: after the Market we’d head home for a moment, and then set out to traverse what I’ve come to think of as our “local food trail,” heading the right way down Kent Street and thus removing the dizziness. 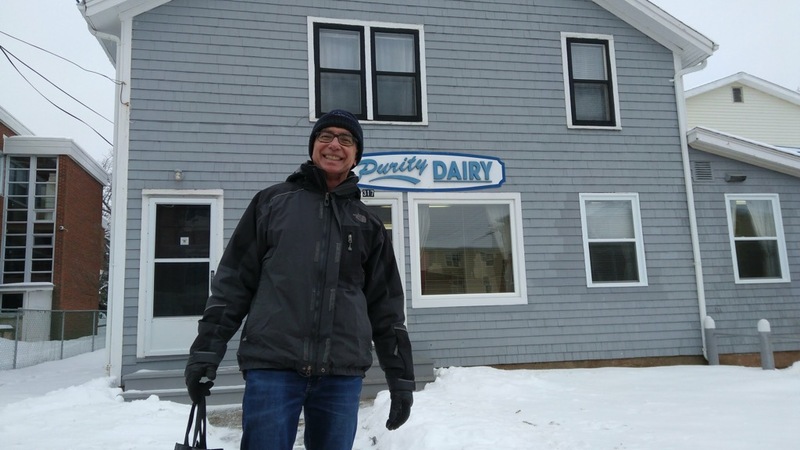 I first met Tom Cullen, owner of Purity Dairy, many years ago at a dinner party hosted by mutual friends, and we’ve been faithful customers of his ever since. Purity is located on Kent Street just opposite Holland College, and they have a small retail shop in their front office that sells milk, cream, sour cream, and, in an oddly helpful service to customers, ADL butter (ADL otherwise being Purity’s primary on-Island competitor). They’re open weekdays from 8:30 a.m. to 4:30 p.m. and on Saturdays from 8:30 a.m. to 1:00 p.m. Purity has a parking space out front set aside for customers to pop-in, and we’ve taken advantage of this, and the retail simplicity of the setup, to allow Oliver to do the milk run for the past couple of weeks: I give him a chit that says “2 litres of 3%” and he runs in to pick it up while I wait in the car. This past Saturday, as it happens, Tom Cullen himself happened along while I was waiting, and so I was able to have a chat with him and grab a photo. 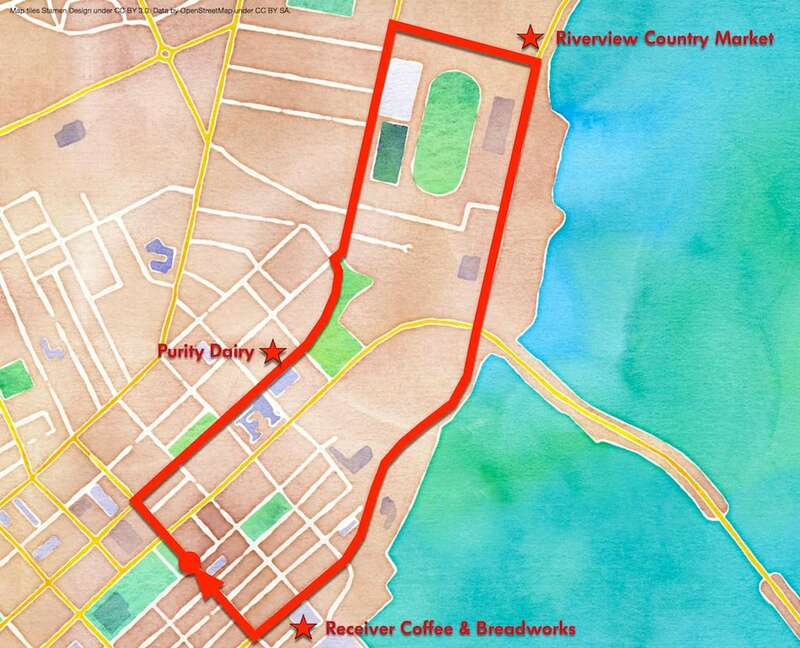 From Purity Dairy, it’s an easy drive along Kent Street to Kensington Road, and then down Exhibition Drive to Riverview Country Market. 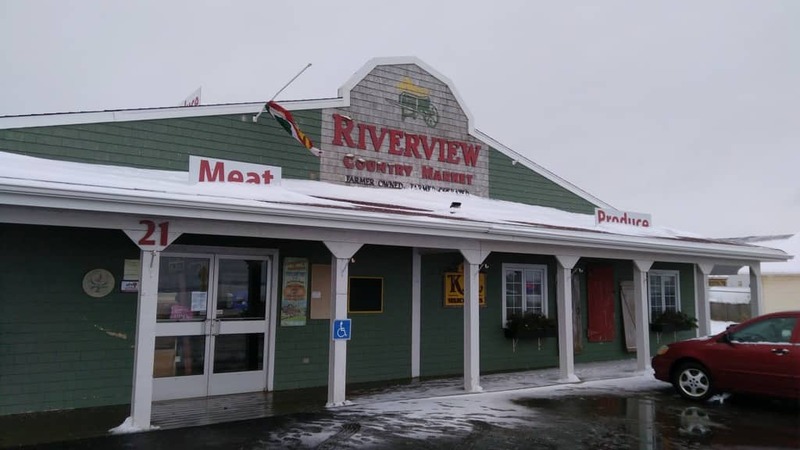 We’ve been customers of Riverview Country Market for many years; Riverview has found a sweet spot in the marketplace, offering locally-grown produce along with a variety of imported goods. This Saturday we bought lettuce, broccoli, cauliflower, peppers, apples, and frozen blackberries. 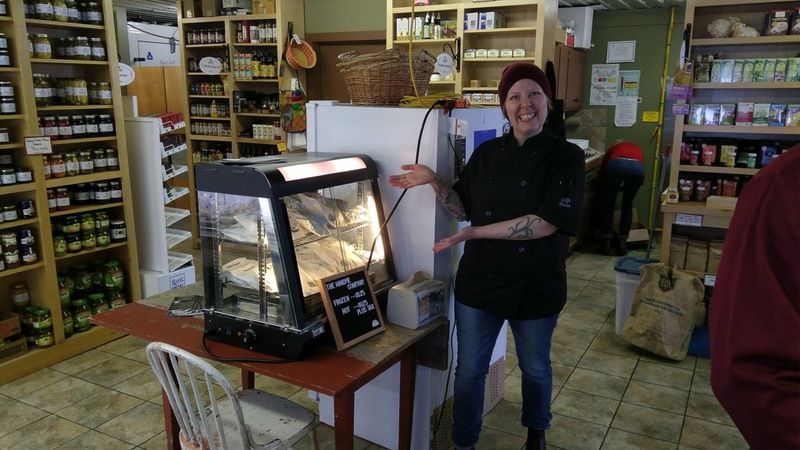 As a special bonus, this Saturday was also The Handpie Company Pop-up at Riverview, so we got to chat with Handpie Sarah and to pick up some of her pies for Sunday supper. Eagle-eyed readers will notice that Sarah brought Pie Man in with her for the pop-up: you can see him in the bottom-right corner of her sign. It’s also worth mentioning that Riverview acquired a coffee machine last year, and is making some of the best espresso-based drinks in town these days. Leaving Riverview Country Market on Riverside Drive, we head back downtown via Water Street to make our last stop, at The Brass Shop. We’ve also been longtime customers of both Receiver Coffee and Breadworks, and now that they’re under the same roof, roasting coffee and baking bread out of the Brass Shop, it’s doubly convenient. And their presence on the Trail means that we now make a weekly stop for coffee and bread whereas previously we’d been more hit and miss. 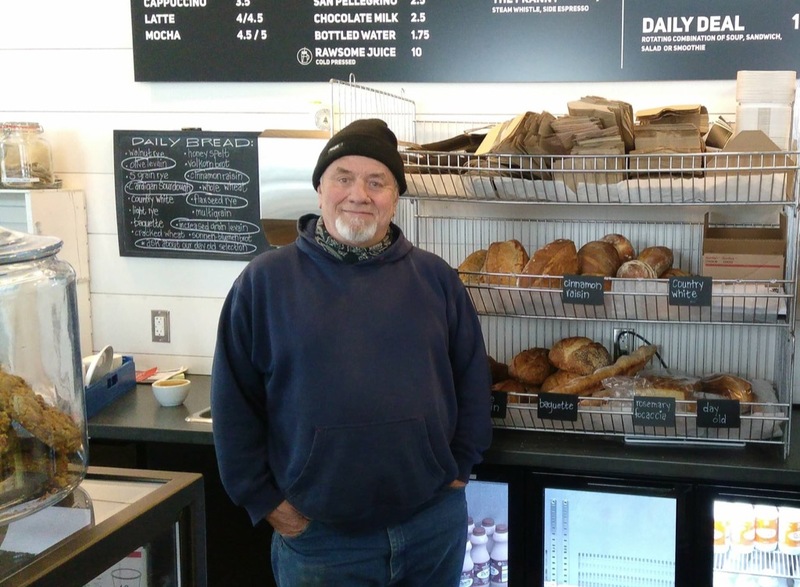 The real draw at Breadworks of late has been that baker John Dale has been making olive bread on Saturdays, and has been fine-tuning his recipe every week, getting ever closer to perfection. In addition to the olive bread, I also picked up a pound of Receiver’s coffee, as we were running low at home. This route from Purity to Riverview to the Brass Shop is new for us this month, and so we might mix it up a little in the weeks to come. A stop at Kent Street Market is not outside of the realm of possibility, as they fill in some of the local food gaps in our weekly shop that Riverview doesn’t carry. And I’ve been wanting to become a more regular customer of the Royal Pita Bakery out toward Winsloe; it doesn’t seem like a natural candidate until you factor in that the PEI Humane Society Dog Park is out that way too, and when they re-open after construction we might be able to serve Ethan’s needs as well as our own. Local food advocates have a long list of reasons why shopping for local food is a good idea, and I subscribe to most of them. The visceral motivation for doing so, however, is that I enjoy buying food produced by people I know, people I can chat with, people who I keep in mind when I’m enjoying their wares, and people who, I hope, have me and my family in mind as their plying their trade. Written January 22, 2018 at 11:08 a.m. I do agree with you, my philosophy of life is that if you have to eat it, it should be the best quality. Encouraging our local merchants is always a good idea. Peter, I like what you say and I like the way you say it.